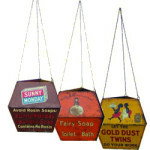 This antique Fairbanks Gold Dust Washing Powder box is a rare, valuable find. 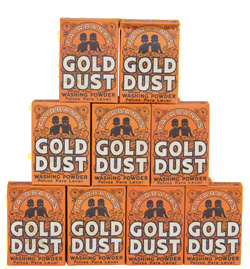 It is an orange cardboard box featuring two African-American children surrounded by golden coins near the top, with a banner crescent over them that says, “Fairbanks.” Beneath them, it says “Gold Dust” in large, white letters. In small print beneath that is says, “Washing Powder.” The N.K. 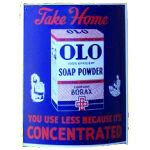 Fairbanks Soap Company was distributed under the Lever Brothers Company from the 1890s through the 1930s.